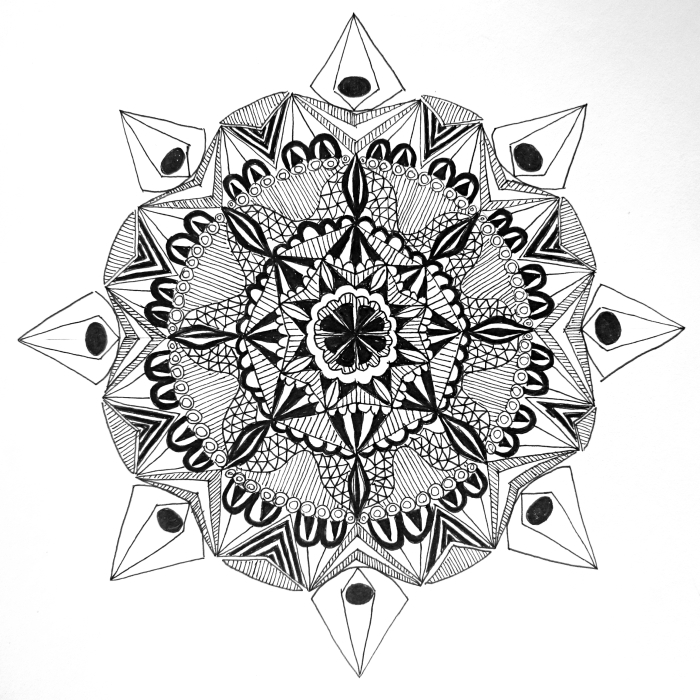 Way back in September, one of the assignments in the Drawing Project was to draw a mandala. I tried it and became hooked from my very first one. There's something about the repeating patterns and the organic way that the designs unfold that is mesmerizing, meditative and addictive. I drew a few for myself, and then I included some in a self-care kit that I made for a good friend for Christmas. I did them as line drawings so that she could colour them in as a way to relax and detach from the stress of her master's program. Her mom saw them and asked to buy some and I realized that other people might need help with their colouring cravings as well. So I made some more. Each mandala starts with my handy dandy dollar store compass set. I draw a few concentric circles, then divide the pie into quarters, then eighths. Then I go wild, adding whatever shapes and patterns come to mind. I never know how they're going to turn out when I start, which makes them pretty darn fun to draw. I use a 0.3 micron pen and the occasional dab of whiteout when a line doesn't turn out quite how I want. Each one is totally unique and they all have different feels, from more geometric and solid, to more organic and fluid. Let me know which one is your favourite! In my Etsy shop I now have 5 patterns that you can buy individually, or you can get a pack of all 5. These are instant downloads, which means that as soon as you pay, you can download the files to your computer and print them out as many times as you like. Use them as a relaxing, meditative practice, or do them while you watch Netflix. Once they're coloured in you can use them to decorate your office or art space too. I hope you enjoy colouring these as much as I enjoyed drawing them! Have fun getting lost in the shapes and leaving your stress behind.